Main parts to built PIC robotic webcam are two servo motors and microcontroller PIC. 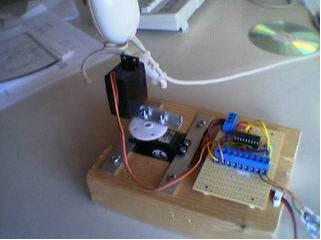 This eletronic project not too hard to build it if you have some electronic basic and programming the microcontroller. For the main processor this project utilized PIC 16F84. The total cost of the project is about 40 Euro (40$). All the software/code can be downloaded as free or shareware.